A security camera is one of the most effective burglar deterrents you can get for your home. Aside from scaring intruders off of your property, a home camera system also allows you to see what goes on in your home- even if you’re miles away. In finding the right type of security camera, but you first need to know where you want to have it installed. If you want a camera that can monitor your lawn or your front door, you should consider getting an outdoor camera. This type of camera is typically made out of weatherproof materials to withstand changes in temperature. However, if you’re considering having a security camera to monitor your living room or the nursery, then you should look for an indoor camera. Aside from these types, there are other cameras created to meet varying security needs. A pan-and-tilt camera, for one, allows you to scan your property by simply tapping on your smartphone. A motion-activated camera, on the other hand, automatically records event at the first sign of movement. Around 80% of surveillance footages are found to display poor image quality. As a result, they are often unhelpful in most case investigations. If you want to get the most out of your security camera; you should keep an eye for higher camera resolution. Look for security camera systems that are able to record HD quality images. 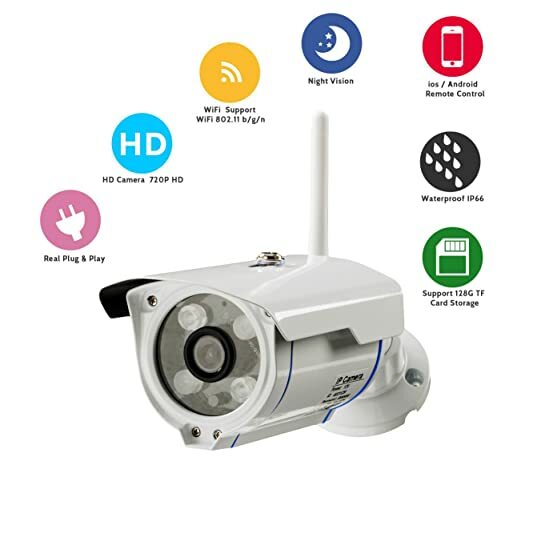 On such note, if you want to further increase the security of your home and property, a security camera with night vision feature can really help. You have to keep in mind, however, that not all cameras with night vision are the same. There are units that are able to record fine footages even in the dark. Using a dome-shaped camera offers a lot of advantages. Because of its shape, people would have a hard time figuring out exactly where the camera is looking at. This style also offers a wider field of vision than regular security cameras. Bullet cameras, on the other hand, are considered more effective in discouraging burglaries and intrusion because they are more obvious. Aside from being more visible, this type of camera offers a longer range which makes them a practical choice if you’re aiming to keep an eye on your backyard. As a general rule, it’s recommended that you install a security camera on every entry and exit points at home. This means you have to make sure there is one unit at your front door and another one at your back door. It’s also a good idea if you can have one installed in your garage. Because you need multiple security cameras, it’s advisable that you get a unit that’s scalable. This is to avoid any inconveniences you can experience in adding several new cameras and their licenses. Remote monitoring features are becoming more common among security cameras today. You wouldn’t have a hard time finding a unit that can allow you to monitor your home through your smartphone or computer. Remote surveillance enables you to get an advanced warning of any event at home. When partnered with motion sensors, you’ll be able to verify a burglary just before it happens. It can also help you take immediate actions. Seeing smoke, for example, can help you reach out to local authorities faster to prevent a full blown fire from happening. Most security cameras come inclusive with an online storage account. If you are to purchase these cameras, it’s important to verify first how secure the encryption is as well as the process. You should also take note of the strength of the password you’re using. Because low security can easily put your recordings and information at risk for hackers; it’s better to check and double check. On the other hand, there are units that can store your recordings locally. This is more advantageous if you want to have a physical copy of your surveillance footages. However, if you want to get the benefits of being able to access your security feeds anytime and anywhere, you should consider saving them online. Having a surveillance camera at home is not a complete guarantee that your home is going to be entirely safe against any crime. There are several factors that may or may not affect your home security. However, as every preventive measure is important, it’s wise if you can have your security camera up and running now. I remember the time my dad transferred the security camera from our living room to our garden. It didn’t last for a week (it was winter)! I didn’t realize there were so many options to consider with these cameras. I’m curious is the waterproof really holds up during the winter months when it’s snowing? Just how much “water”can they handle? I’d go for a security camera that’s packed with features. The remote access through smartphones (either Android or iOS) is such a great feature because you can easily monitor what’s happening wherever you are. Some people try to save up and get standard camera but end up with poor quality images. I say go for HD quality because sometimes bad guys get away with the crime because there’s no way to tell for sure if they were the ones in the video because of poor camera quality. When it comes to security, you need the best. My preferred security camera must possess the following features. HD camera (at least 720p, it’s all about the picture quality. i currently use the Arlo Smart Home Security Camera System. It boasts of all these criteria and more. Great article! thanks for sharing. I would make a checklist of this criteria in choosing a suitable security camera system for my workplace. A dome-shaped camera is better for a front pouch or as an indoor camera because it is difficult to know where the camera is pointing at. For a visible rotational camera, a burglar would simply wait for the camera to rotate from his field of view before committing the crime. there are also infrared dome-shaped cameras for night vision. To me, size, video quality, and remote control monitoring are three of the most important features I look for in home security cameras. I travel a lot so I rely on security cams to monitor my house remotely when I’m away. I placed the cams in strategic locations where I know burglars will most likely enter. Although many of us put our faith in security cams, we also need to use our brains to outsmart criminals. I had my cameras hidden from view so the burglars wouldn’t be able to destroy or spray paint them. HD quality is a must. I can’t tell you how many cameras I have been through that produce horrible picture and video quality. I always go for full HD. It may be a lot more in cost but being able to identify people is needed when it comes to home security. Night vision and being HD are two things I always look for when shopping for security cams. Without night vision what is the point? Having an HD lens helps ensure the footage you capture will be clear and visible as well.